JMP Engineering is a privately owned company specialising in robotic automation, robotic palletising utilising Kawasaki robots and pallet wrapping solutions. JMP has been in business over 30 years and are industry leaders in robotic palletising providing complete turnkey product handling and robotic palletising systems, that incorporate Kawasaki robots with JMP pallet dispensers, JMP conveyers and JMP pallet wrapping and ancillary equipment. 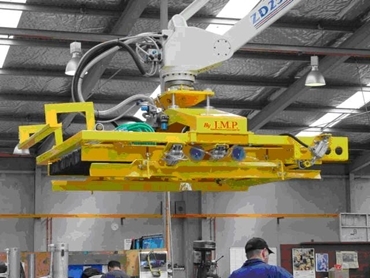 JMP recently supplied a challenging and interesting robotic product gripper for an installation in Dubai. The design requirement was to take glass bottles from one point and palletise them onto a pallet. Then put them on, then pick and place 504 bottles at one time, and then an inverted cardboard layer tray on top of each layer of bottles. Each pallet would then be packed up to approx 2200mm high, before it would then move along a pallet conveyor. The precision controlled air clamps the bottles via the gripper tubes at the pick up point, then the robot positions the entire layer of bottles to the pallet position, then vacuum is applied to the same tubes to rapidly deflate them, releasing the bottles onto the pallet enabling rapid placement and withdraw, ready for the next layer. JMP models both the palletising system, Kawasaki Robot and the gripper in 3D. This ensures perfect fit and design optimisation of the components to the JMP design. The ability to do this enabled JMP to have a working 3D model with accurate components to show how the unit would look and function before any manufacturing was started. The significant benefit of using such design tools is to eliminate rework due to unforeseen design issues. When deadlines are looming and margins are tight, reduction and elimination of rework is important. It is also good to work on JMP gripper weights even though the Kawasaki ZD 250 has a 250kg payload.